Do you believe your property is experiencing a water leakage problem? 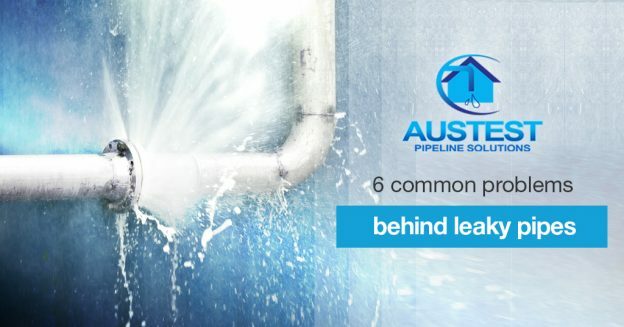 Our advanced equipment and experienced Melbourne team can help to locate many types of water pipe leak issues, specializing in Underground pipe leak detection techniques throughout Melbourne. Are you experiencing a high water bill? Is there a damp area inside or outside of your home or building? Have you found internal or external cracks on your premises? Is there a musty smell around your property? Or do you just suspect you have a water leak, but aren’t sure where to start? 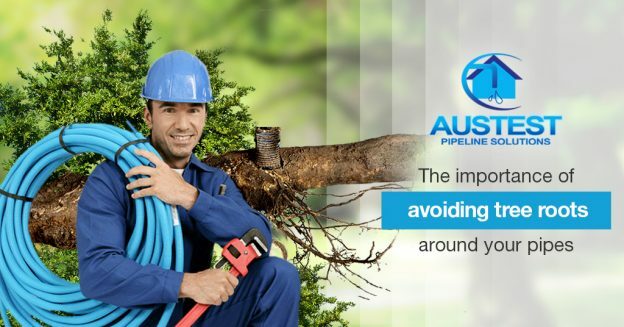 Then call Austest Pipeline Solutions, your non-destructive water leak detection experts. 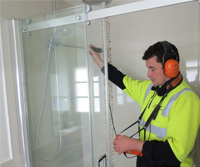 We are licensed and trained in the field of water leak detection and specialise in water loss from any below ground or above ground systems, whether it is mains pressure, sewer drains, gravity fed stormwater drainage systems or charged stormwater drainage systems. We have over 20 years of experience in the industry, so we are truly experts in analyzing aboveground and underground water pipe issues! When it comes to underground water pipe leak detection, we have several methods available. We can use acoustic, non-destructive methods to listen for noise in pressurised pipes, or tracer gas detection which is where we insert an inert gas into your pipelines. 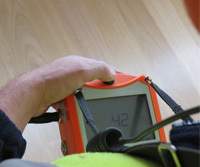 We also use loss analysis with correlation equipment to locate leaks on water mains and fire services. Thermal imaging and infrared cameras are used to detect leaks in balconies and on hot water pipes. Water leak detection requires different methods depending on many factors, such as the location of the leak and the depth of piping in the case of underground leak detection. With our highly trained team and expert experience we can get the job done quickly and effectively. Although some plumbing problems can be fixed on your own, other problems are difficult to diagnose without special expertise and equipment, and that’s when water pipe leak detection experts are there to help. We perform CCTV drain inspections to sewer and storm pipes to locate any defects in these systems. Air and hydro water leak detector testing can also be performed to confirm the integrity of below ground drainage systems. Our experiences have produced a wealth of tools to solve every kind of leak problem in residential, commercial, and industrial situations. 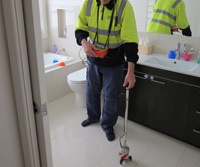 If you know you have a leak on your property, it is time to book our underground water leak detection Melbourne services so we can pinpoint the exact location for you. Not all leaks are mains pressure requiring main water line leak detection. Some can come from your gravity fed storm and sewer drains. If left unattended, they can cause severe damage to the foundations of your house. The faults with these drains are normally noticed with internal or external cracking to walls, or windows and doors not opening or closing properly. Find out more signs of water leaks and how they can be repaired here. The first method we use to confirm the integrity of these drains is CCTV drain inspections. Our technicians will be able to accurately locate any defect in these drains with our specialized underground water detector tools and mark the position using our location equipment. We also offer drain relining services in Melbourne in the case of a storm drain or sewer drain leak being found. Damp areas in your home or building, unusually high water bills, and the appearance of damp-loving pests like silverfish are just a few signs that the plumbing in or around your building is compromised. A water meter test is one way to see if there is a leak in your water system. We also provide services for locating and repairing water leaks under concrete slabs, a common source of basement water leaks. Whether your pipes need a simple repair or to be fully replaced or re-routed, we’re ready to take on the job. Locate with the aid of sondes and traces any PVC or other plasticized line or conduit. 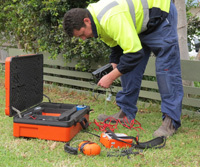 AusTest CCTV Drain Inspections Pty Ltd is using state-of-the-art equipment including advanced correlation technology.